Our parish has a two year preparation program for First Communion (also known as First Eucharist) and First Reconciliation preparation. Why? The mysteries of the Eucharist and Reconciliation require that the child have a deep foundation in order to understand and fully receive the Sacraments. Please read below to learn which applies to your child. First Communion preparation normally begins in the First Grade. 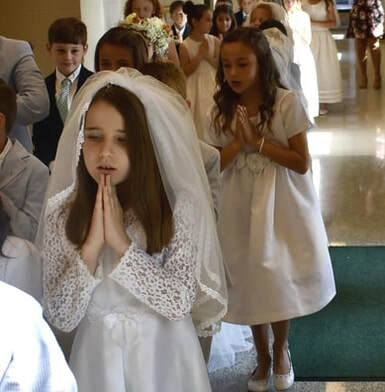 If your child does not attend a Catholic School, they will need to attend First Communion Year 1 classes and miss no more than FIVE classes to advance to Year 2 formation. If they attend a Catholic School, their school's religion classes will count for their Year 1 preparation. All students are required to participate in Mass every weekend and holy day. If your child is in Second Grade but has no prior year of Faith Formation, they will need to first complete First Communion Year 1 class. Please register them for First Communion Year I. If your child is in Third through Fifth Grades, please email the Parish Office. If your child is a Third through Fifth Grade student at a Catholic school, you are not required to register your child for Year 1. The school year at a Catholic school will be considered your child's Year 1 requirement. Please contact Fernando Cartagena, Director of Youth Ministry. ​​These students will prepare for the Sacraments of Eucharist and Reconciliation through our Youth Ministry program. 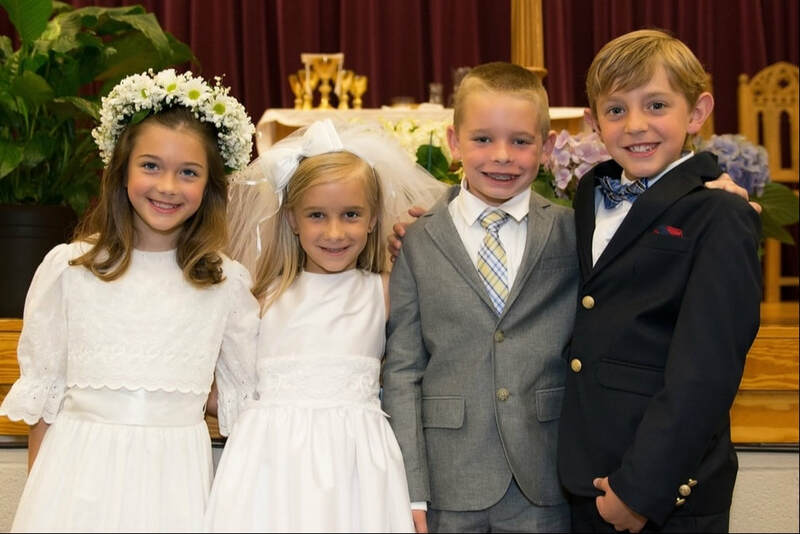 ​Any student entering into a First Communion Year 2 or Elementary Sacramental Prep Year 2 classes must first have completed the prior year of Faith Formation in a parish, Catholic school, or Catholic homeschooling program approved by the parish. ​​If the year was completed anywhere other than in our parish Faith Formation program, a verification letter must be provided by the school or parish in which it was completed and sent to our parish offices. The Sacraments of Initiation (Baptism, First Communion, Confirmation) initiate a child into the life of the Church. For this reason, children receive Sacraments in their home parish (which may or may not be where they attend school). Since Catholic schools do much of the preparation for First Communion and First Reconciliation, students in Catholic schools will only meet a few times a year in our parish program for Year 2 preparation. Catholic school students, therefore, must complete Faith Formation classes in their parish for Year 1 or pass religion class in their Catholic school for Year 1. Parents, please send us verification that your child has completed a Year 1 program (e.g. letter from parish, copy of school report card, etc.) here. 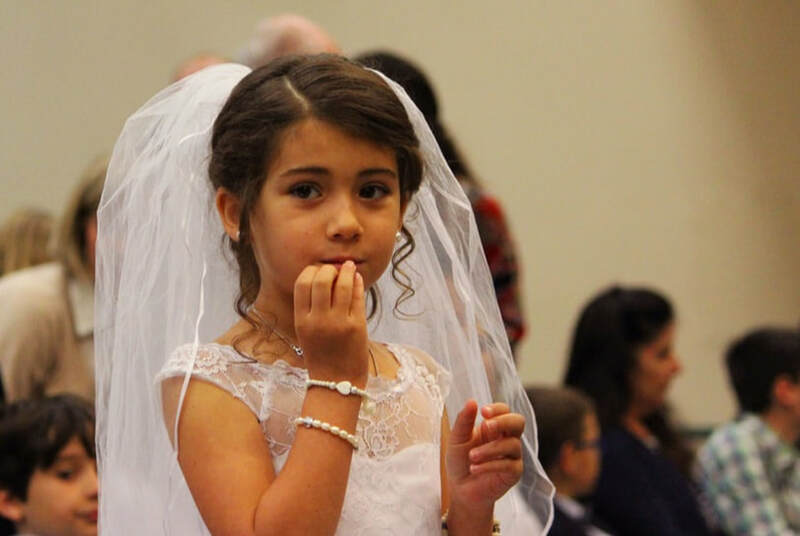 Register your child for the First Communion Catholic School Year 2 class. At least one parent and child attend the three Catholic School Family Formation sessions. Participate in Mass every weekend and holy day. We ask students who are home-schooled using a Catholic curriculum to present texts of the curriculum for prior year formation and current year formation to the Director of Faith Formation and register in the Catholic School class. At least one parent and child attend the Catholic School Family Formation sessions. Year 2 Non-Catholic school students will meet weekly throughout the year. At least one parent and child attend all of the Family Formation sessions. Miss no more than FIVE classes throughout the school year.